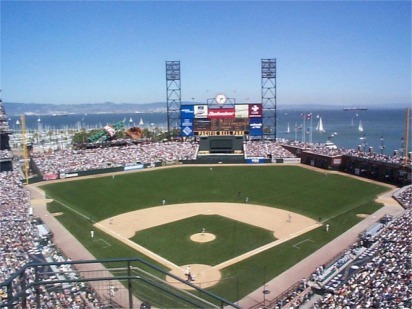 Pacific Bell Park changed its name to SBC Park before the 2004 season, then to AT&T Park before the 2006 season. They totally got this one right. I sat in the third deck near the left-field foul pole one game, and in the front row behind home plate (when you buy single seats to meaningless weekday afternoon games months in advance, you can sometimes get lucky) for the other game. I love the notion of being able to watch the game for free, from a suitably crappy vantage point, just by meandering along the public walkway between the bay and the stadium. I love that every cheap seat has a view of something beautiful. I love the quirkiness of the outfield dimensions and the height of the walls. This is the best of the new parks I’ve visited–made even better by the knowledge that every dime that went into it was private money. If the garish Coke bottle beyond the left-center field wall is the price for avoiding taxpayer money for ballparks, to me, that’s a reasonable tradeoff. Even the new SBC name, which I dislike greatly, is fine with me if it keeps the taxpayers out of it. As much as I enjoyed the night game hanging out with a friend in the upper deck, I must admit the prospect of sitting front-and-center for any game in PacBell’s inaugural season really got me psyched. I entered through the Diamond Club, which has its own private concession stands (God forbid we share them with the unwashed commonfolk who have to pay the puny $19 to sit in the upper deck). Not that I would ever use said concession stand: I had my own menu to wave at an usher, who would run to get my my hot dog and popcorn if I so desired. In fact, for a few extra bucks, I bet I could get him to raise the food to my lips for me. Such is the life of the upper-crust like me. People surrounding me were asking me “So, how do you enjoy your season tickets?” I said: “I don’t have season tickets.” They couldn’t believe I’d gotten this ticket the old-fashioned way: from TicketMaster. They told me that similar seats were going for several hundred dollars on eBay, way more than the reasonable $35-ish I’d paid for mine. But the front row of the section behind home plate in PacBell Park has nine seats. The four on either aisle are season-ticket holders. As of 2000, the one in the middle was up for grabs to nomadic loners like me. Try for it next time you’re in San Francisco on your own. It wasn’t the separation from the lower classes that I most enjoyed about being in the front row. It was, of course, being close to the game. Fieldin Culbreth was the home plate umpire that afternoon, and it was fun to hear his calls so clearly. After the game, it was also nice to see him give the contents of his ball bag to a youngster in the front row. I enjoyed watching the players in the on-deck circle surveying the pitchers. And my favorite vantage point for watching home runs remains right behind the catcher. Something about the distance looks more impressive. Bill Mueller’s shot to right…well, it’s got to stay way up high to make those couple of rows of seats out there. From where the ball is hit, it’s easier to sense just what kind of shot is necessary, and how hard it must be to do, than from anywhere else. I got to see promotions up close, too, as the national anthem singer, ceremonial first pitcher, and everybody else walked out right in front of me. They let a kid be PA announcer for the first three batters of a half inning, and that kid was close enough to me that I could see the mix of nerves and delight as she said “The pitcher, number 46, Kirk Rueter” into a microphone that blasted her nine-year-old voice over these thousands of people and out into the bay. “Way to go, Katie!! !” I shouted…I made it a point to remember her name so I could congratulate her. Both games were dogs, but the ballpark, like any good ballpark, redeemed them. It’s not fair to compare a wonderful new park like this to a wonderful old park like Fenway. But this ballpark is absolutely fantastic. I’d pay for plane tickets down just to catch a weekend series. Even if I have to sit with commoners. Not too much. Livan Hernandez pitches a heck of a game, throwing over 140 pitches, but can’t quite hang on for a shutout or a complete game. Jeff Kent homers during his MVP year.